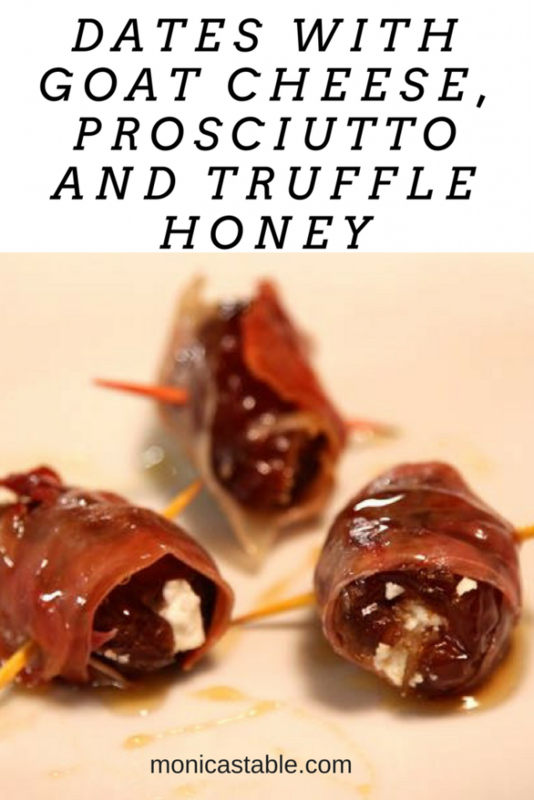 You might be scratching your head at this recipe – Dates with Goat Cheese, Prosciutto and Truffle Honey – I know it doesn’t sound spectacular, especially if you’ve never sampled truffle honey. I urge you to try it. make it earlier in the day, sauté the dates, drizzle with honey and you have an amazing appetizer people will talk about for ages! This recipe comes from a local wine bar. I almost passed it up on the menu but I was so intrigued by the truffle honey. The chef was so gracious, he came out and explained how to make it and even sent us home a jar of his homemade truffle honey. I had no idea what a gift that was until the wine bar closed and I had to search out another source. Never fear, if you don’t have a source for truffle honey you can use the plain version but the truffle lends a touch of elegance. This is one of our favorite appetizers. It’s always a hit – even if people think they don’t like dates. There is something magical in the combination and I urge you to try it. This recipe comes from one of our favorite wine bars. I almost passed it up on the menu but I was so intrigued by the truffle honey. This has become one of our all time favorite appetizers. It can even be served as a first course. 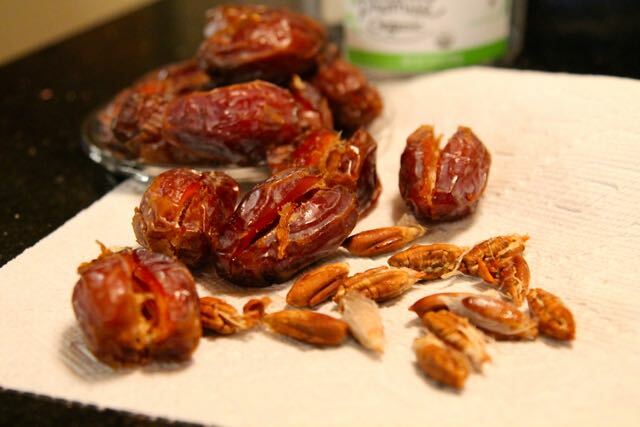 This is always a hit - even if people think they don't like dates. There is something magical in the combination and I urge you to try it. If the dates contain pits, slit them lengthwise and pop out the pit with a knife. Stuff each date with about 1/2 - 1 Teaspoon of goat cheese making sure you can close the date around the cheese. 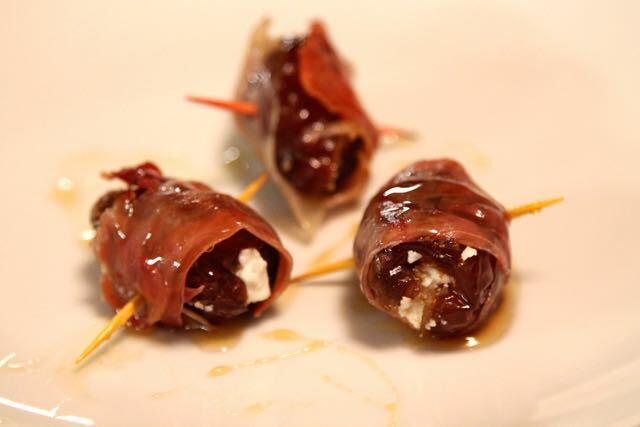 Divide the prosciutto lengthwise and wrap each date with a strip of the prosciutto then secure with a tooth pick. Film a skillet with the olive oil and heat over a medium flame. 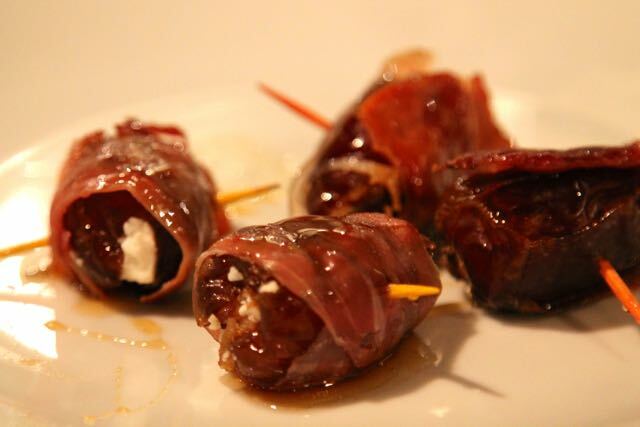 Add a few of the wrapped dates and sauté to crisp the prosciutto and heat the date and melt the goat cheese. Remove the dates to a plate and hold them in a warmed oven. 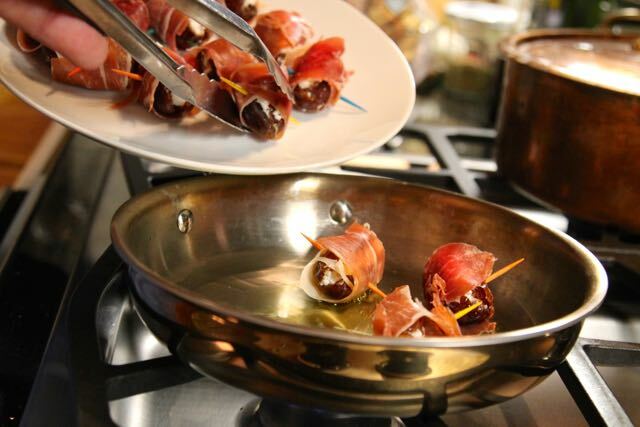 When all of the dates are crisped, remove the plate from the oven and drizzle with the truffle honey. Serve immediately. 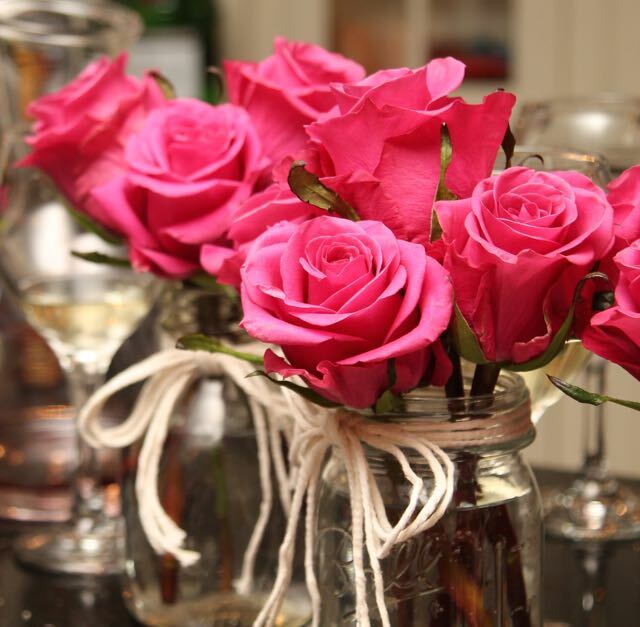 These are the epitome of FANCY! They looks savory, sweet, and simple. All the things I need in a fancy app! Such a delectable sweet-salty combo!! These sound amazing! I need to get that honey!! I love truffle oil, so I know I love this honey!! These look sooo good! 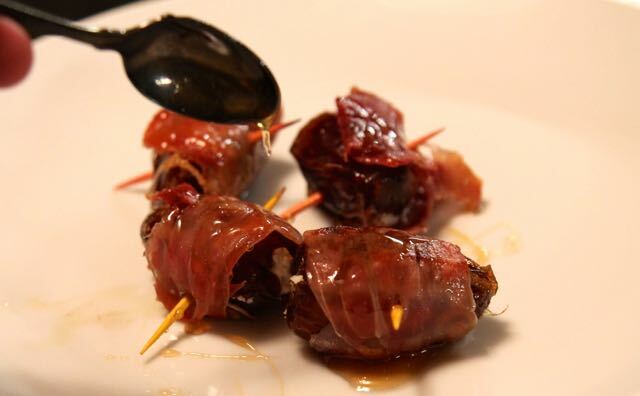 I love dates and proscuitto together. The sweet and salt is perfect for me! These look divine. That chef was so nice to give you honey. Too bad the wine bar closed. These are such a great appetizer. Yes – it was a sad day when they closed but luckily the chef was so generous with his recipes, we have some great dishes to remember them by. I LOVE the sound of these dates. I am just worried that I won’t be able to stop eating them! I know – it’s difficult not to eat the whole plate especially when they are warm from the pan! I am definitely intrigued by the truffle honey, I am going to have to look for that. This combo sounds amazing! The truffle honey is special but this is good even with regular honey. Thanks for stopping by! I love this combination of flavors! Hi Monica, I bet these dates are wonderful with the salty and sweet flavors you have going on here, looks delicious!! 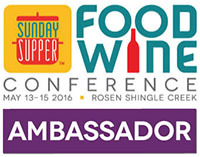 I think this appetizer sounds amazing…..what wine would you pair with it? 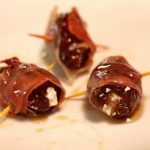 I know I would absolutely devour these – I love dates with prosciutto as it is but the additions sound wonderful. I have never heard of truffle honey, I know I will have to go and look for it. I love dates and all of the other ingredients in this recipe. I am sure it would be a big hit with company. Of course, I might not want to share! 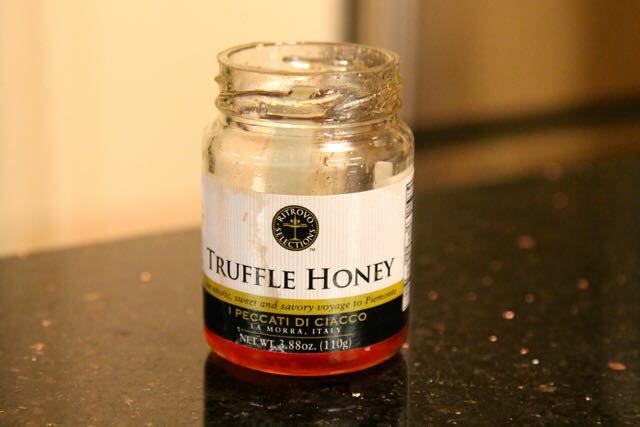 I’ve never had truffle honey, but how nice the chef sent you home with some! The flavor combo is definitely intriguing. Thanks for sharing, Monica!